The Mitchell Park Conservatory, “The Domes”, in Milwaukee, Wisconsin is a place where visitors can explore the desert oasis, trek through the tropical jungles, and stroll through the North American gardens all in one afternoon. The Mitchell Park Conservatory began in 1898 when the original conservatory was built consisting of a few exhibited flowers in a greenhouse. This building was erected until 1955 when it was deemed unsafe and demolished. Donald Grieb designed a plan to construct 3 glass domes shaped like beehives and entered the design into a contest for the new Conservatory. 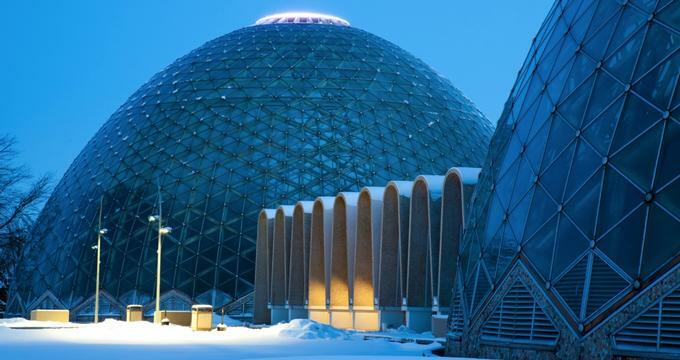 The local architect won and the plans for a 140 in diameter, 85-foot-high conservatory with 15,000 square feet of growing and exhibition space was put into the developmental stages in 1959. The total cost of The Domes, which included the Desert, Tropical and Floral Show Domes, was $4.5 million and construction was completed in phases so as not to need capital from public bonds. Construction was completed in 1967 and the Mitchell Park Conservatory was opened to the public. In 2008, a grand-reopening ceremony was held to reveal the newly installed LED lighting system and light show. The Mitchel Park Conservatory is open 7 days a week including holidays from 9am to 5pm, but closes an hour early on weekends and holidays. Admission prices and discounts, including free days, are outlined on the Mikwaukee County Parks webpage. Visitors should allow one hour to explore all three domes. Desert Dome- The Desert Dome features some of the finest collections of cacti, succulents, shrubs, and bulbs in the world and focuses on regions of Africa, Madagascar, The Canary Island, South and North America. All the plants showcased in the Desert Dome thrive in hot, dry climates and are grouped by geographic regions along pathways of Desert Palms. Visitors will also find a desert oasis in this dome with shaded date palms, a small pool with aquatic life, and an ethnobotany garden. Tropical Dome- Visitors to the Tropical Dome will discover more than 1,200 species of tropical plants, birds, and other rainforest products. In this Dome, many of the plants that decorate our homes and offices can be found such as flowering plants like philodendrons, bromeliads, orchids, and ferns; however, visitors will also find banana, cocoa, and coffee bean plants, macadamia trees, spices such as cardamom and black pepper, vanilla, and hardwoods like ebony and mahogany. Floral Show Dome- This dome opened in 1964 and is one of Milwaukee’s most popular attractions. More than 150 floral displays have been housed in this dome since its inception, each with a unique theme and design. Themes are either historical, cultural or fantasy inspired and are chosen for display at least one year in advance. The plants for each exhibit are grown in the Horticulture Division Greenhouse Center and moved in place for the show which runs 6-14 weeks. Plantings can change multiple times per show season. The process of setting up each show can take up to two weeks and involves landscape architects, horticulturists, and other tradesmen. There are many ways to enjoy The Domes in an educational and interactive way through guided or self-guided tours at Mitchell Park Conservatory. Groups that are participating in self-guided tours of The Domes should register one week in advances while those groups requesting guided tours, led by an interpretive educator, should be booked at least 2 weeks in advance. Group Discounts are available. Educational Tours for grades k-12 are developed to meet national education standards while college Educational Tours are developed at the instructor’s request. College tours are only available on select days while grade school tours are available daily. Each program includes a 30-45 tour with additional activities such as a plant or bird scavenger hunt to be completed after the tour. Participants should allow up to 2 hours for these tours to be completed. Details on programs by grade level are available on the Milwaukee Parks webpage. The Mitchell Conservatory offers opportunities to bring the community together through special public events, as well as private events. Festivals, concerts, workshops and other fun activities are outlined on the events calendar online. Although no camping is allowed in Mitchell Park, there are two overnight lodges available to be rented for Youth groups and other private events. Show Dome Transition- This special event covers the making of the Floral Dome Show and occurs during the transition between shows. Usually happening over a 2-week period, visitors can watch as a new show is brought to life. Pollinators Week- This week in June focuses on the affect that Pollinators such as bees and butterflies have on our lives. Visitors can sample food, see animals up close, and go on nature hikes.